Google Docs code includes references to some upcoming features that could make the service better suited for storing media content. There are many references to a preview pane that will allow you to view more information about your files and even check the content without actually opening the files. There's even a player for audio files, much like the video player launched last week. The preview pane will probably allow you to play music files from the Google Docs homepage. 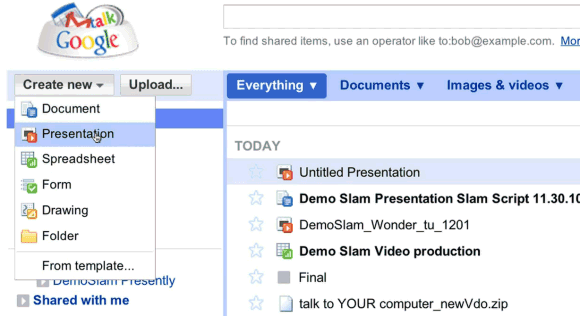 Another new option lets you group files from multiple folders in collections. At the moment, Google Docs includes a small list of applications, but that will change when you'll be able to add third-party apps. That's why Google will have to add a new option for selecting the application that will open a certain file. It's likely that some of these features will be available in the new Google Docs interface that has been accidentally revealed in a YouTube video. Awesome. I'm really looking forward to this update and HTML5, offline Docs (especially until I get WPA2-Enterprise wireless connectivity at school!). Alex, how do you think the Docs media player will integrate (or run in addition to) the Chrome OS Media Player? Maybe they'll play the same files. with Chrome OS close to launch, looks like Google Docs is being pushed. better media management, some of Dropbox's best features, and it will be much more tempting to move everything into the cloud. I think the music player is going to link in with the cloud streaming service they are bringing to Android. They're gonna have to give us more than one measly GB if this is gonna be worth using. Yes, I know you can buy more space, but why would I when I have a free 10 GB Dropbox account? Gmail offers 7.5+ GB of storage, so why is Docs (and also Picasa) so limiting? Just give me 10 GB and let me use that space however I want across all Google services connected to my account. that seems like a real full os. so you can arrange every service in one place, to make it easier for us. because its becoming to much! Huhm! $5 for 20gb a yr and I get to stream movie content to any device that has flash phone tablet whatever and your complaining you probably spend more than that on lunch. Yep, it will be connected with Google Music and Android :). But : WHEN will we have a Sync tool to sync GDocs with our local files... ?!? Is there a tool to do that ? My biggest issue with Docs is not being able to properly format as APA. I really wish Google would create an option to select MLA or APA formating so that college students would be able to use it. As it stands I normally type in Docs and then have to export it to Open Office to format it correctly. I love the being able to access my work from anywhere with internet access and the constant saving which provides me with security from a multitude of issues. Now if they would solve this issue I would be ecstatic. @Mike. I'm confused. Docs is incapable of producing APA formatting?